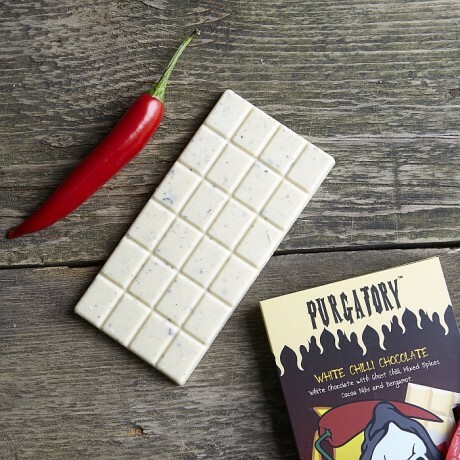 Naga Chilli white chocolate bar. Handmade in England. Presented in a glossy wallet tied with ribbon. 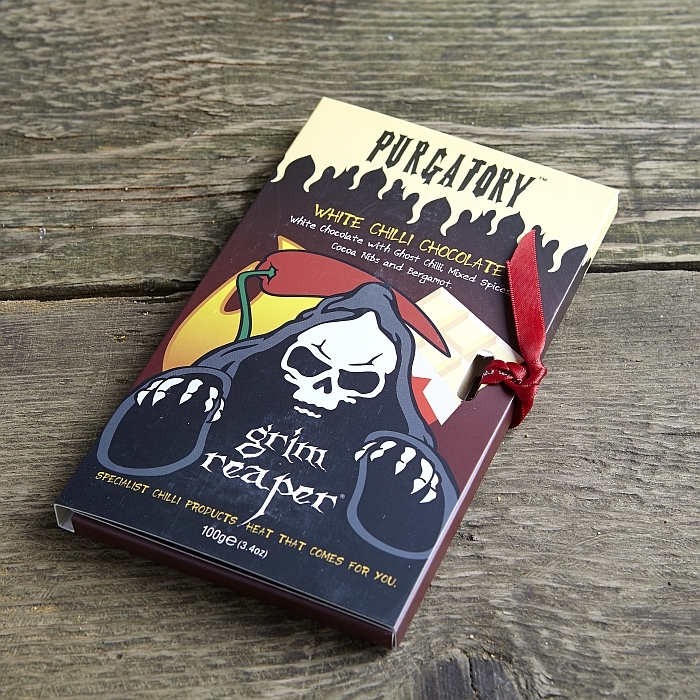 Cleanse your soul and confess your sins with this precious white chocolate bar. Blended with naga chillies, cocoa nibs, bergamot oil and mixed spices...Are you pure enough to enter a world of Heavenly taste? White chilli chocolate with hot naga jolokia, mixed spices, cocoa nibs and bergamot-INGREDIENTS: White chocolate: sugar, cocoa butter, whole milk powder, cocoa mass (28%), emulsifier-soya lecithin, natural vanilla; cocoa nibs, essential oil of bergamot, mixed spices, naga jolokia chilli (0.3%). Suitable for vegetarians. This product is dispatched by Grim Reaper. This item has a shipping weight of 340g. Minimum quantity for "Purgatory Chilli White Chocolate Bar" is 3.